It’s no secret that the Pacific Northwest is home to legendary rivers. Even the U.S. Congress knows it. They recognize more Wild & Scenic Rivers in Oregon than any other state. 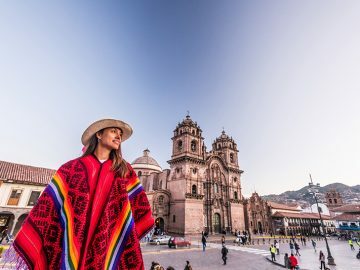 To a rafter, the sheer quantity of overnight trips can fill a lifetime. If you ask an Oregon boater about their favorites, you’ll get a varied response. Some like rafting through volcanic lands, others prefer the rainforest, while others love desert rivers best. The one thing for certain is that if you like rafting, you’ll love Oregon rafting. Here’s a handy guide to some of our favorites. 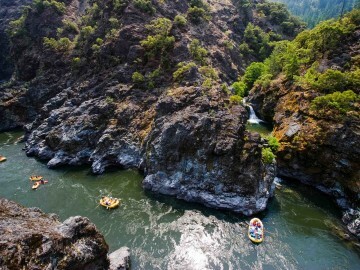 When most folks think of Oregon rafting, the Rogue River is the first that comes to mind. The 34-mile Wild & Scenic run has a little bit of everything. 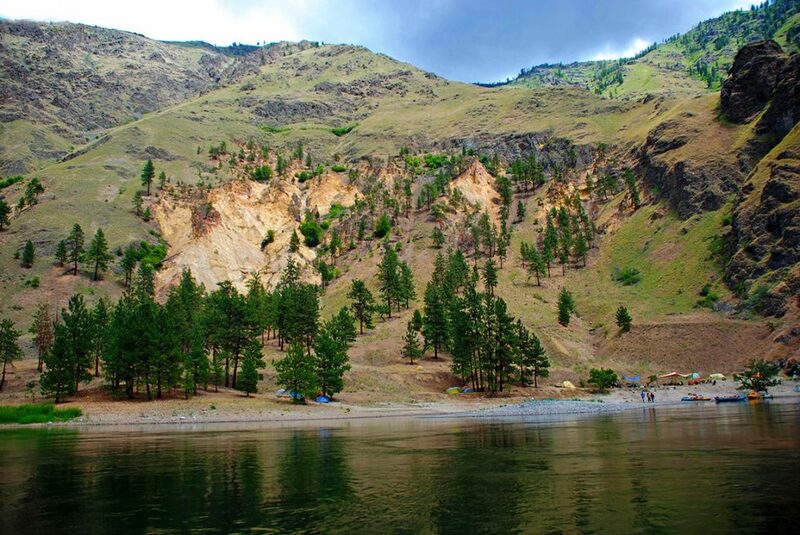 There’s fantastic scenery with the drama of Mule Creek Canyon, grassy hillsides which meet impressive forested canyon walls, and beautiful river camps that make this a gorgeous stretch. 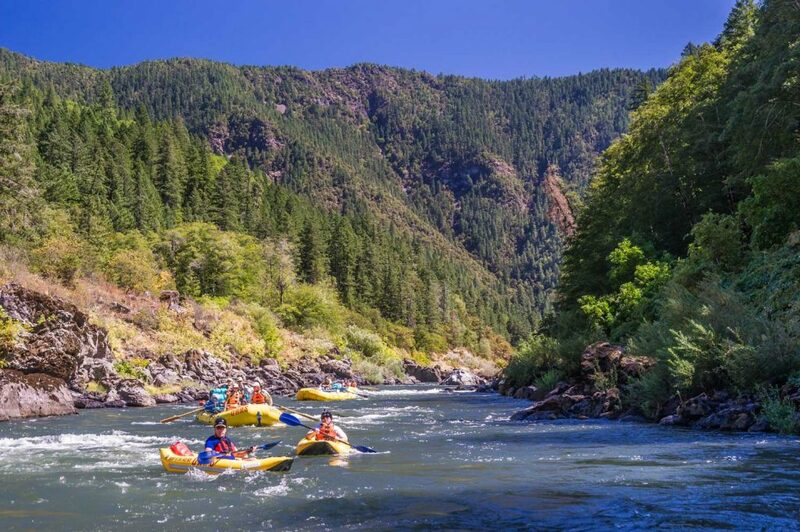 Combine that with exciting whitewater, like Grave Creek, Rainie Falls, and the most famous rapid in Oregon, Blossom Bar, and you have a river that serves up beauty alongside action. The sandy beaches, old miner cabins, and natural water slides don’t hurt the experience either. 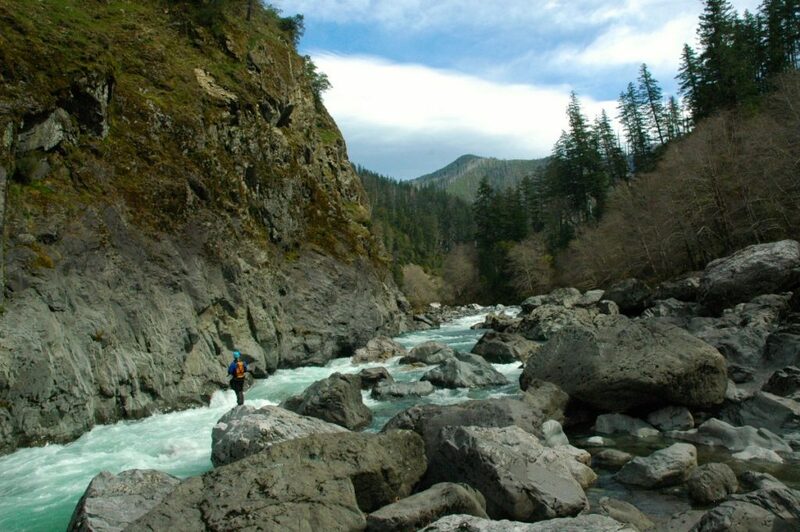 One of the most unique features with the Rogue River is that even though it runs through the wilderness, there is a hiking trail that follows its length and there are a handful of lodges scattered along its course. 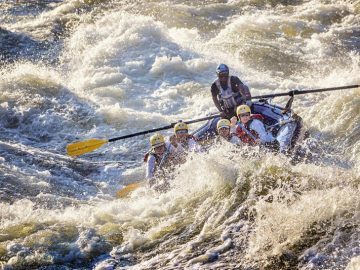 The end result is a wild river with deep cultural history that’ll stoke river runners from beginner to expert. The 78-mile trip down the Snake River on the Oregon/Idaho border from Hells Canyon Dam to Heller Bar is unlike any other. The Seven Devils Mountains in Idaho rise to the East making this the deepest canyon in the country, even deeper than the Grand Canyon. The river, too, is massive. It can easily reach 60,000 cfs in late spring. There are many Class II and III rapids, but two major rapids of note. The first is Wild Sheep with a massive wave that eats 18-foot rafts for lunch. The second major rapid is Granite, and it features a wave that likes to hit the eject button. No matter how you fare through the rapids, the Snake delivers. 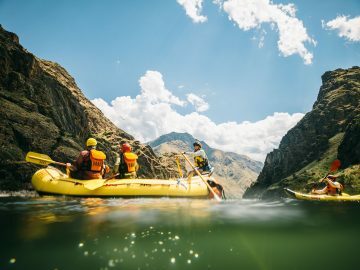 With over 200 archaeological sites, seemingly endless side hikes, sandy beach campsites, and huge rapids, the Snake River is Oregon’s biggest rafting experience. The Owyhee River in Southeast Oregon has more rattlesnakes than people. There is only one town, Rome, and they didn’t even bother to count its population in the 2010 census. 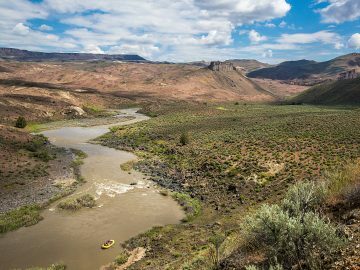 The 11,000-square mile watershed is the driest in the state, and yet for those who hit the narrow window when the Owyhee River actually flows, it’s unforgettable. One thousand-foot cliffs tower over the river. Hot springs bubble up along the banks. You float past abandoned ranches, ancient petroglyphs, and the whitewater should not be underestimated. 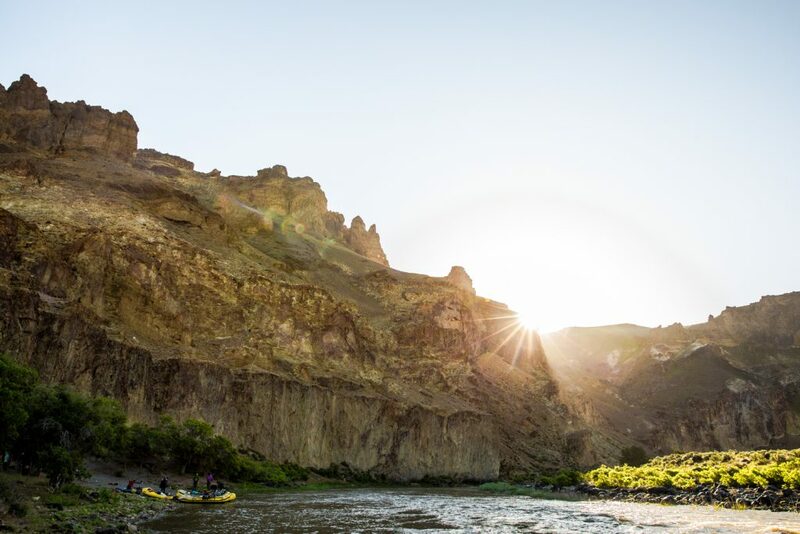 There are over 200 miles of boatable water, with the Lower Owyhee serving up a popular combination of whitewater, solitude, and incredible desert scenery. 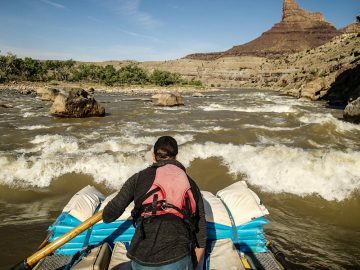 The Middle Owyhee features Class IV rapids and the infamous Class V Widowmaker, and therefore is for expert river runners only. No matter which section you float, you are guaranteed a healthy dose of solitude. 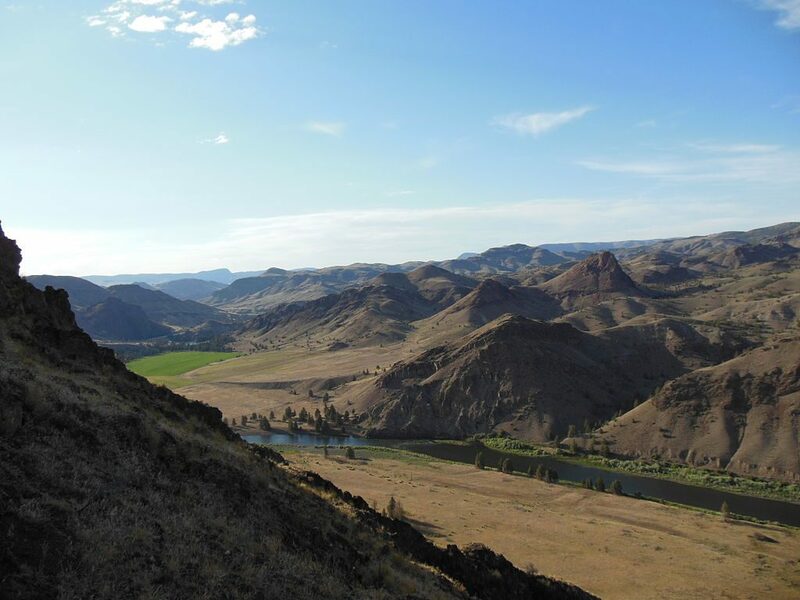 The John Day River in Central Oregon is the longest undammed river in the Pacific Northwest. There are four forks that drain from the Blue Mountains and Strawberry Range before forming the main John Day. The result is 280 miles of classic boating through semi-desert country. Descending from the mountains you’ll pass through lodgepole and ponderosa forests with abandoned ranches before entering a deep and twisting canyon. Here you pass through John Day Fossil Beds National Monument which showcase an ancient bestiary of saber tooth tigers, rhinoceros, and woolly mammoth fossils. It’s mostly Class I+ water with a smattering of larger rapids that are perfect for dory boats. You can connect all the sections for one of the longest continuous floats in the entire country on an undammed, wild river. The Illinois River is the Holy Grail of Oregon whitewater. Some who seek it never find it. Others find it and are scared senseless. Still, those few fortunate boaters who run the Illinois each year bring back tales of glory. It’s a tributary of the Rogue River in the Siskiyou Mountains of Southern Oregon that is run much less often than talked about. Since the Siskiyou receive little snow, the river only runs when there’s enough rain; too much rain, and the Class IV rapids stack up. The infamous Green Wall rapid (Class V) features massive hydraulics down a steep rock garden. What’s more is that this 32-mile stretch is entirely within the wilderness so any mistakes are magnified by the remote nature of the run. Those with the skill and guts however are rewarded by crystal clear water, beautiful rapids, and the sense of accomplishment that comes from running the wildest whitewater in the state.